Several studies have found that chronic kidney disease (CKD) is a predictor of cardiovascular mortality (1,2). The risk for cardiovascular mortality increases progressively with greater declines in kidney function. The reasons for this elevation are likely to be due to a greater prevalence of both traditional and nontraditional cardiovascular risk factors (3,4). In a previous analysis from the Cardiovascular Health Study (CHS), which focused on cardiovascular disease and mortality, we also noted that kidney dysfunction, estimated by serum creatinine, predicted noncardiovascular mortality (5). In that study, the relationship of kidney function with mortality seemed J-shaped, perhaps because creatinine levels also depend on relative muscle mass, and elderly individuals with low creatinine may have low muscle mass from malnutrition and therefore experience excess mortality. Also, specific causes of death were not evaluated. Because cystatin C is not associated with muscle mass, it affords an opportunity to characterize better the association of kidney function with mortality risk. Cystatin C is a cysteine protease inhibitor that is produced and secreted by all nucleated cells, filtered by the kidney, and degraded by the proximal tubule. Thus, cystatin C is an endogenous marker of GFR (6,7). Its levels are not dependent on muscle mass (8). We have previously found that cystatin is a stronger and more linear predictor of cardiovascular mortality and heart failure than estimated GFR (eGFR) or serum creatinine (9,10). To further explore the noncardiovascular mortality risk of elderly individuals with kidney disease, we evaluated the rates of specific causes of death by levels of cystatin C and eGFR in CHS. The CHS is a longitudinal cohort study designed to evaluate the interrelationships among traditional and nontraditional cardiovascular risk factors, subclinical cardiovascular disease, and cardiovascular outcomes in community-dwelling elderly individuals in the United States (11). The study recruited eligible individuals who resided in the households of individuals who were identified from an age-stratified random sample from Medicare eligibility lists in Forsyth County, NC; Sacramento County, CA; Washington County, MD; and Pittsburgh, PA. They and household members and spouses were invited to participate in CHS when they met the following inclusion criteria: (1) age ≥65 yr, (2) not institutionalized, (3) expected to remain in the current community for 3 yr or longer, (4) not under active treatment for cancer, and (5) gave informed consent without requiring a proxy respondent. Fifty-seven percent of those who were invited to participate enrolled in the study. The initial cohort was recruited in 1989 to 1990, and a second cohort of 687 black individuals was recruited in 1992 to 1993, resulting in a total of 5888 participants. All individuals provided informed consent. The measures of kidney function used in this analysis were cystatin C and eGFR. Cystatin C was measured on frozen samples that were collected at the 1992 to 1993 visit. The study population for this analysis was the 4637 participants who had both cystatin C and creatinine measured in 1992 to 1993. Participants who died before this study visit were excluded. Detailed methods for blood drawing, quality assurance, and assay performances have been described previously (12). Cystatin C was measured using a BNII nephelometer (Dade Behring Inc., Deerfield, IL) that used a particle enhanced immunonepholometric assay (N Latex Cystatin-C) (13). Polystyrene particles were coated with mAb to cystatin C that agglutinate in the presence of antigen (cystatin C) to cause an increase in the intensity of scattered light. The increase in scattered light is proportional to the amount of cystatin C in the sample. The assay range is 0.195 to 7.330 mg/L, with the reference range for young, healthy individuals reported as 0.53 to 0.95 mg/L. Among 61 healthy individuals with three cystatin C measurements over a 6-mo period, the intraindividual coefficient of variation was 7.7%, reflecting long-term stability of the measurement. The assay remained stable over five cycles of freeze/thaw without change in the measurement. Serum creatinine was measured using the Kodak Ektachem 700 Analyzer (Eastman Kodak, Rochester, NY), a colorimetric method. We estimated GFR using the four-variable version of the Modification of Diet in Renal Disease equation: GFR = 186.3 × (serum creatinine−1.154) × (age−0.203) × 1.212 (if black) × 0.742 (if female) (1). Event ascertainment for incident events followed a defined protocol, and events were adjudicated by committee, using a protocol previously described (14). Deaths other than cardiovascular, cerebrovascular, atherosclerotic, or other vascular diseases were considered noncardiovascular deaths. For the noncardiovascular deaths, the cause of death was considered to be the underlying cause rather than the immediate cause of death. The deaths were classified into 19 disease/organ system categories. Given the small number of events in some categories, we collapsed the events into five categories: Dementia, cancer, pulmonary disease, infection, and other. Pulmonary death included pulmonary embolism and respiratory failure. Infectious death included pneumonia, sepsis, and other infection (excluding perforated viscus). Death secondary to other causes included renal failure, liver failure, gastrointestinal (GI) disease (GI hemorrhage, perforated viscus, other GI disorders), trauma, amyotrophic lateral sclerosis, Parkinson’s, epilepsy, metabolic, amyloid, hip fracture, failure to thrive, myelodysplasia, and other musculoskeletal. Covariate data were from the same visit as cystatin C and creatinine (eGFR) measurement (1992 to 1993), except for forced expiratory volume in 1 s (FEV1), which was measured at study entry. Diabetes was defined as the use of insulin, oral hypoglycemic agents, or fasting glucose level ≥126 mg/dl. Race was categorized as black or nonblack. Body weight was measured using a calibrated balance beam scale. C-reactive protein (CRP) was measured using an ELISA (15). Hemoglobin and white blood cell count were measured in local hematology laboratories near each field center, with monitoring of internal and external quality assurance reports (12). FEV1 was measured using a water-sealed Collins spirometer (W.E. Collins, Braintree, MA) as described previously (16). Physical activity was calculated as kilocalories from activities, including housework and exercise using the Minnesota Heart Survey questionnaire (17). The 1992 to 1993 cognitive status was assessed using the Modified Mini-Mental Status Exam (3MSE) (18). Ankle-arm index (AAI) was measured after 5 min of rest in the supine position. BP cuffs were applied to the right arm and both ankles. After identification of each artery using palpation or a Doppler stethoscope (8 MHz; Huntleigh Technology, Inc., Luton, UK), the BP was measured for each artery using a standard mercury manometer. The lowest ratio of AAI was used for these analyses. The common and internal carotid arteries were evaluated by high-resolution B-mode ultrasonography to determine the maximal intimal-medial thickness (IMT) (19). Prevalent cardiovascular disease was defined as history of coronary heart disease (myocardial infarction, angina, bypass surgery, percutaneous coronary angioplasty, or use of nitrates), claudication, congestive heart failure, transient ischemic attack, or stroke (20,21). Demographic characteristics, risk factors, and subclinical cardiovascular disease measures were compared using t test, Kruskal Wallis test, or χ2 when appropriate. We evaluated the functional form of the relationship of cystatin C and creatinine using a spline function. Natural piecewise-cubic splines were used with the specified sequence of interior knots placed at the quartiles of the distributions of cystatin C and creatinine, respectively. A creatinine concentration of 1 mg/dl and a cystatin C concentration of 1 mg/L were selected as the reference groups for these analyses because they approximated the median values to allow similar precision at both ends of each curve. To compare the predictive ability of cystatin C, creatinine, and eGFR for noncardiovascular mortality, we also constructed receiver operating characteristic (ROC) curves and determined the area under the curve (AUC). We first constructed unadjusted curves and then curves adjusted for age, race, and gender. The curves were compared using the method described by DeLong et al. (22). Cox proportional hazards models were used to examine the relationship of cystatin C and eGFR with total noncardiovascular mortality adjusting for age, race, gender, weight, physical activity, diabetes, smoking status, systolic and diastolic BP, carotid IMT, AAI, CRP, white blood count, hemoglobin, cognitive status (3MSE), and FEV1. Covariates were selected when they were hypothesized to confound potentially the relationship of kidney function with noncardiovascular mortality. Cox models also were developed for each of the cause-specific rates. Given the smaller number of events when classified by specific cause, these mortality analyses adjusted for age, race, and gender only (other variables, in addition to creatinine, in the Modification of Diet in Renal Disease formula). Follow-up was to June 30, 2001 (median 7.4 yr). S-Plus (release 6.1; Insightful Inc., Seattle, WA), Intercooled Stata (release 8.0; Stata Corp., College Station, TX), and SPSS statistical software (release 12.0.0; SPSS Inc., Chicago, IL) were used for the analyses. P < 0.05 was considered statistically significant. Confidence intervals (CI) are expressed as 95% CI. Participant characteristics are summarized in Table 1. There were 1318 deaths: 785 (59.6%) noncardiovascular and 533 (40.4%) cardiovascular. As compared with those who remained alive throughout study follow-up, those who died from noncardiovascular death were older, more likely to be male, and more likely to have a history of smoking. Demographic characteristics and smoking status of participants who died of noncardiovascular mortality were similar to those who died from cardiovascular causes. The proportion with prevalent cardiovascular disease and subclinical atherosclerosis for those with noncardiovascular mortality was intermediate between those who were alive and those with cardiovascular mortality. Creatinine and cystatin were higher and eGFR were lower in participants with cardiovascular and noncardiovascular mortality than in those who remained alive; however, there was no difference between those who died of cardiovascular disease versus noncardiovascular disease. Noncardiovascular mortality rates increased with higher cystatin C quartiles (Figure 1). In contrast, the association with serum creatinine was J-shaped. Using ROC curves, all three measures of kidney function predicted noncardiovascular mortality, although the AUC for cystatin C was higher (AUC 0.72 versus 0.71 versus 0.70 for cystatin C, creatinine, and eGFR, respectively; P < 0.0001 for cystatin C versus eGFR or creatinine; Figure 2). The association of cystatin C and eGFR with an increased risk for noncardiovascular mortality rate remained after adjustment (Table 2). After adjustment, the highest quartile of cystatin C was associated with a 69% higher risk and the lowest quartile of eGFR (<60.17 ml/min per 1.73 m2) was associated with a 36% higher risk for noncardiovascular mortality. Because individuals with noncardiovascular mortality had a higher prevalence of cardiovascular disease and atherosclerosis and cardiovascular mortality is a competing risk, we examined the association of cystatin C in individuals with and without prevalent cardiovascular disease. The association of cystatin C with noncardiovascular mortality was similar in those with and without prevalent cardiovascular disease (hazard ratio, 2.20 [95% CI, 1.78 to 2.71] versus 2.00 [1.45 to 2.56] per 1 mg/L higher cystatin C), adjusted for age, race, gender, weight, kilocalories of physical activity, diabetes, smoking status, systolic BP, diastolic BP, carotid IMT, AAI, CRP, white blood count, hemoglobin, cognitive status (3MSE), and FEV1. 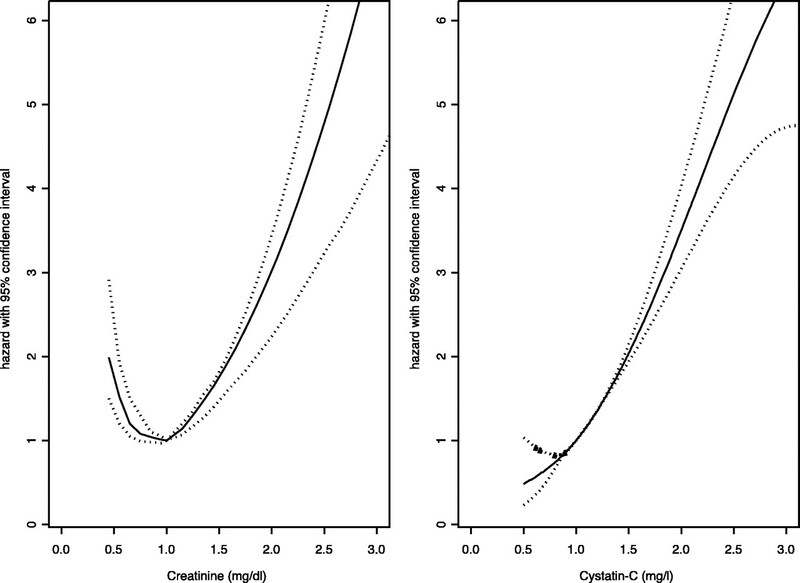 Relationship between cystatin C and creatinine and the log hazard for noncardiovascular mortality (adjusted for age, race, and gender). The hazard ratio and 95% confidence intervals are natural cubic spine functions. Creatinine concentration of 1 mg/dl and cystatin C concentration of 1 mg/L are the reference groups. 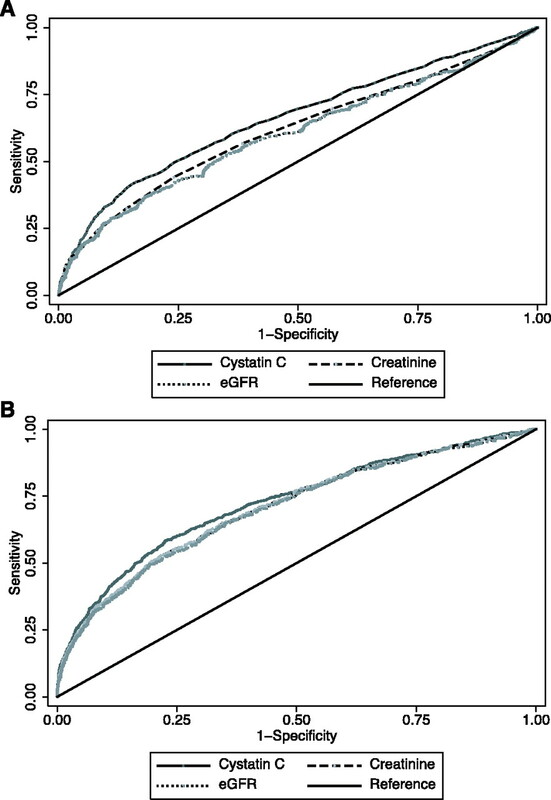 Receiver operating characteristic curves demonstrating the ability of cystatin C, creatinine, and estimated GFR (eGFR) to predict noncardiovascular mortality. (A) Unadjusted. Area under the curve for cystatin C 0.66, creatinine 0.62, and eGFR 0.60; P < 0.001 for cystatin C versus creatinine and cystatin C versus eGFR. (B) Adjusted for age, gender, and race. Area under the curve for cystatin C 0.72, creatinine 0.71, and eGFR 0.70; P < 0.001 for cystatin C versus creatinine and cystatin C versus eGFR. We examined cause-specific mortality rates by cystatin C and eGFR quartiles. The rates of death secondary to pulmonary disease, infection, cancer, and other causes were higher in individuals with higher cystatin C or lower eGFR levels (Table 3). Mortality risks secondary to dementia and cancer were greatest in the fourth quartile of cystatin C. However, risk for death from infection or pulmonary causes seemed to increase incrementally across quartiles. For eGFR, the rate of death secondary to infection increased incrementally across quartiles, whereas for the other causes, the higher rate was seen in the fourth quartile. Overall cystatin C and eGFR quartiles had a more linear association with cardiovascular than with noncardiovascular mortality (Table 3). Although there was not adequate power to adjust fully for other covariates, the association of cystatin C with each mortality outcome (except dementia) remained after adjustment for age, race, and gender (Table 4). After adjustment for age, kidney function was not associated with death from dementia. After adjustment, the lowest eGFR quartile (<60.2 ml/min per 1.73 m2) was associated with a higher risk for death from infection and other causes, with a borderline association with cancer death. We found that kidney function independently predicted noncardiovascular mortality. The rate of noncardiovascular mortality increased across quartiles but was most apparent in the highest quartile of cystatin (>1.2 mg/dl) or in those with an eGFR <60 ml/min per 1.73 m2. We also found that the increase in mortality was present for many underlying causes of death rather than being driven by a specific organ failure. However, because of the relatively small number of cause-specific events, we were unable to determine whether kidney function was associated with each mortality outcome independent of risk factors other than age, gender, and race. Although previous studies have not examined the association of CKD with noncardiovascular mortality, Nissenson et al. (23) examined hospital admission data and found that patients with CKD were more likely to be admitted for nonrenal causes, including pneumonia, than patients without CKD. They did not report actual causes for admission to compare cardiovascular and noncardiovascular causes. Our noncardiovascular rate of death was less than for dialysis patients in the United States Renal Data System, but there were some differences depending on the underlying cause. For example, the unadjusted rates of death secondary to cancer are higher (19.9 versus 13.9/1000 patient-years), although the rates secondary to infection are lower (7.0 versus 49.0/1000 patient-years) than in United States Renal Data System patients who are older than 65 (24). The lower rate of death secondary to cancer in patients who are on dialysis could reflect decreased acceptance of patients with cancer into dialysis programs. However, previous studies have suggested that cancer rates are higher in ESRD when compared with the general population (25,26). There are several reasons that kidney disease may be associated with a higher risk for noncardiovascular mortality. The prevalence of risk factors for noncardiovascular death, such as smoking and inflammation, is greater (27). Although we controlled for both smoking and FEV1, a surrogate of smoking-related injury, our adjustment for smoking exposure may be inadequate. Furthermore, our models may not have adjusted for other important comorbid conditions for which decreased kidney function is a marker. Second, patients with kidney disease are more likely to be frail (28) and therefore could be more likely to die in the setting of acute illness. Third, recent studies have also found diabetes to be associated with higher risks for death secondary to multiple noncardiovascular causes (29–32). Indeed, Coughlin et al. (29) found that diabetes predicted cancer mortality and postulated that insulin resistance and hyperinsulinemia may play a role in the pathogenesis of cancer. CKD is also associated with insulin resistance (33), which could provide a possible link between higher cancer mortality and CKD. There are a number of limitations of our study, and we consider our results to be hypothesis generating. The results need to be replicated in other studies, and further work on potential mechanisms is needed. It can be difficult to assign a primary cause of death, and individuals often disagree on the underlying cause (34,35). In addition, whether the immediate cause (e.g., aspiration pneumonia) or the underlying cause (e.g., dementia) should be used is controversial. Not taking into account the main underlying cause of death has led to underreporting of the importance of diabetes and kidney disease as causes (31). In CHS, the distinction between cardiovascular and noncardiovascular disease was adjudicated thoroughly. However, the protocol for adjudicating the cause of noncardiovascular mortality was not as well defined; therefore, there may have been misclassification across the noncardiovascular causes. We also do not have a gold standard measurement of GFR. Both cystatin C and eGFR are estimates of GFR. Cystatin C has been shown in a number of studies to be a better predictor of GFR than measures derived from serum creatinine, and this could account for its stronger prediction of noncardiovascular mortality (36–39). However, Knight et al. (40) found that cystatin C is associated with nonrenal factors (e.g., weight, inflammation), in addition to its association with creatinine clearance. These factors could account for the differences between cystatin C and eGFR in the cause-specific mortality models, as these models controlled only for age, race, and gender. We did control for the factors that were found in the Knight paper to be related to cystatin C in our models for total noncardiovascular mortality, but there may be other covariates that we did not control for and that accounted for the differences between cystatin C and eGFR. Overall, however, the results were consistent between these two measures of kidney function and suggest that kidney function predicts noncardiovascular mortality. In addition, although the ROC curves were significantly different, the clinical significance of an AUC of 0.72 versus 0.70 is unclear. Although the recent focus in CKD has been on cardiovascular disease (1), our findings highlight the importance of mild to moderate kidney disease with other adverse outcomes in the elderly. This has important implications for practice and prevention. More research is needed to reproduce these results and, if reproduced, to understand the relationship between kidney function and noncardiovascular disease. It is hoped that this will lead to measures to reduce the risk for morbidity and mortality associated with kidney disease. The research reported in this article was supported by contracts N01-HC-85079 through N01-HC-85086, N01-HC-35129, and N01 HC-15103 from the National Heart, Lung, and Blood Institute. A full list of participating CHS investigators and institutions can be found at http://www.chs-nhlbi.org. L.F.F. is funded by an Advanced Research Career Development award from the Office of Research and Development, Clinical Science Research and Development, of the Department of Veterans Affairs.